The above passage reads “Blessed are those who see the will of God in the Nature, for Mankind and for the Nation,” which is Akira Aoyama’s words. Mr. Aoyama who served as a director of Niigata Civil Engineering Branch Office of the Ministry of Interior conducted the Shinano River Ohkozu Diversion Channel Repair Project in Niigata. That passage is inscribed on the plaque attached to the monument for commemorating the completion of Shinano River Restoration Work, and also is hung in the offices of Director-General and Deputy-Director, Hokuriku Regional Development Bureau, Ministry of Land, Infrastructure, Transport and Tourism. Mr. Akira Aoyama graduated from the College of Engineering, Tokyo Imperial University in 1903 (Meiji 36), left for the USA with unwavering and unflagging resolve to join the Panama Canal Project. He is the first and only Japanese civil engineer who worked on that project from 1904 to 1911. 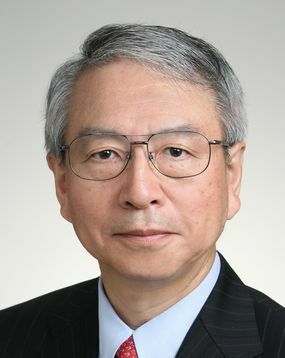 Upon returning home, Mr. Aoyama joined the Ministry of Interior and engaged river, port and harbor development projects like the construction of Arakawa River Flood Discharging Channel and Shinano River Ohkozu Channel Repair Project as the director. Later he was appointed as the Vice Minister of Interior, and selected as the 23rd JSCE President. In the beginning of this May I was in Panama to attend the Annual General Assembly of The World Association for Waterborne Transport Infrastructure (PIANC) and the International Navigation Congress which is held every four year. On the post-conference technical tour, I visited the old Miraflores Locks, the new Agua Clara Locks and Cocoli Locks which opened two years ago, Museo del Canal Interoceanico de Panama and other places related to Mr. Aoyama. At that Museo, I found him surrounded by his colleagues on the project in a photo, at the same time, found myself deeply moved and filled extraordinary happiness. Although I can learn his achievements and accomplishments reading the Civil Engineering Archives published by JSCE, I had such an experience that I stood in the places where he stood, saw what he saw, and touched what he did. That was unforgettable moments and everlasting memories for me, which I will treasure for a long time. Since the new locks opened in 2016, the Panama Canal has allowed for large vessels to pass: it has been making significant influences upon the worldwide network of maritime traffic such as the routing of container vessels, LNG carriers and cruise liners. While the existing locks use electric locomotives to navigate vessels to pass the canal, the new locks use tugboats to position vessels that causes damaging vibrations to gate fenders triggering leakage, wall-tearing, and gate-peeling-off. The Panama Canal marked its Centennial Anniversary of its opening in 2014. American Society of Civil Engineers (ASCE) held its annual convention in Panama from October 7 to 10 to commemorate that anniversary. JSCE sent the delegation of 13 members headed by Prof. Masahiko Isobe the 102 JSCE President, considering for not only enhancing the ASCE-JSCE cooperation, but also organizing the celebrations of centennial anniversary of the Panama Canal’s at the annual convention and of JSCE’s foundation. The delegation held the session focusing on Mr. Aoyama’s achievements in the Panama Canal Project at that convention and carried out a tour to visit the Panama Canal Expansion project, the aforementioned Museo and other places related to Mr. Aoyama. Like Mr. Aoyama, those who challenged themselves to pursue their dreams in the unknown world leaving behind home were rarely found and unique in society in those days. Now we are facing more challenges than ever and have to deal with various challenges one after another without losing sight of our goals. JSCE has been strengthening the internationalization of its activity taking various approaches such as opening international sections, signing a cooperation agreement with its counterparts oversea, and setting up the International Activities Center. The Society will further its effort to support engineers to become “Akira Aoyama” while networking among engineers in and outside the country based on the academic-private and public cooperation. I came to Japan in October 1998 and studied for the master's and doctoral courses in Graduate School of Civil Engineering, the University of Tokyo. 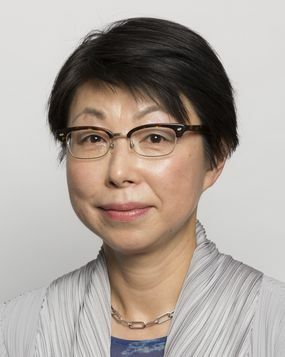 Under the advises of Takashi Matsumoto Sensei (currently Professor of Hokkaido University), I did research on maintenance engineering such as fatigue analysis of Reinforced Concrete (RC) slabs and the repair of RC bridge slab with Fiber Reinforced Concrete (FRC). Although English was official language in civil engineering classes and the research study, I also focused on studying Japanese language to deeply understand Japanese culture and society. With the effort, I was able to acquire the Japanese Language Proficiency Test Level 1 in about two years after I came to Japan. After completing Doctoral course, I started job hunting in Japan. Many senior foreign students worked in research institutes or Universities in their home countries and became a bridge with Japan by collaborating with Japanese Institutions. However, rather than becoming a researcher or a professor, I would like to gain practical experience; therefore, I was looking for a job in a Japanese general contractor. In April 2004, I joined Shimizu Corporation and I was assigned to the Civil Engineering Design Department in Tokyo Head Office. In my self-introduction in Japanese language, I declared that "I would like to be a civil engineer and work Globally as a bridge between Japan and other countries". I have learnt Japanese excellent technology and I think that these advanced civil engineering technologies for infrastructure development in Japan is also useful in developing countries. I aimed not only be Civil engineer in Japan, but also to be a bridge with other countries. When I joined the company, I was only foreign engineer in the division. I learnt Japanese culture, corporate style and manner and I could work as active as a Japanese engineer. At that time Japan faced the issue of "low birth rate and aging population", and domestic demand for construction of new infrastructures was decreasing. Japanese general contractors began challenging global business. This led more opportunities for foreign engineers to contribute. I worked at the Tokyo Head Office around three years experienced the various design works of underground and aboveground Liquefied Natural Gas (LNG) storage tanks, Seismic resistant strengthening Buildings, Power plants, Overseas chemical plants etc. I could learn various Japanese advanced technologies. Utilizing the acquired skills, next step I wanted to contribute to the globalization of Japanese general contractors. In April 2007 I was transferred to the Civil Engineer Technology Department, International Division in Singapore. 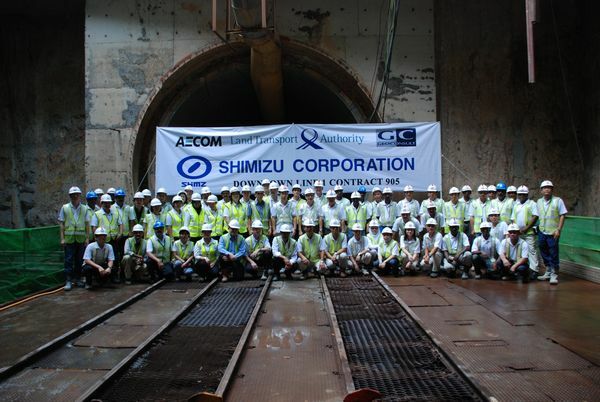 In my first overseas project, I worked in Singapore MRT tunnel construction project. The tunnel alignment was under Marina Bay and connected to Marina Bay Sands, a famous tourist spot in Singapore (Photo 1). By applying Japan's high level of technologies, we could overcome the difficulties of shafts and tunnel construction in difficult ground condition. The project completed successfully in year 2010. Singapore work environment where excellent talent gathered from all over the world, I realized that understanding diversity, motivating cross-cultural organization and creating teamwork are indispensable elements for project success. Shimizu Corporation announced, "SMART VISION 2010" as a management policy in 2010. For global business field, the policy to contribute to infrastructure development mainly in emerging countries was launched. This policy increased more opportunities for foreign engineers to work and have better working environment. 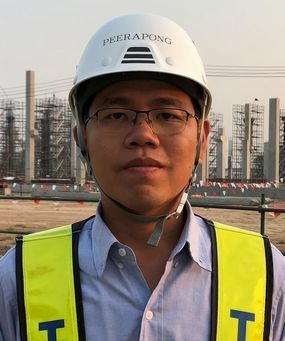 During my ten years in Singapore, I served as civil engineering design manager and technical manager of large-scale infrastructure projects in various countries such as, Singapore's water supply tunnel construction, Singapore MRT construction, Jakarta MRT underground line No. 1 construction, Ho Chi Minh first MRT construction. I felt the pleasure of “Monozukuri” with the completion of construction successfully and "Made by Japan" can guarantee high quality. We could disseminate Japanese State of Art technology to the world. A that time, I felt that I became a global engineer. Nineteen years have passed since the first day I arrived Japan and another turning point came. In June 2017, I was assigned to work in my home country, Thailand. I am responsible for tendering and managing for various construction projects. I wish to contribute to the globalization of the Japanese general contractor by utilizing my experience and to disseminate horizontally Japan's state-of-the-art technology and innovation to the home country and contribute to the economic development of my country. Currently, I am implementing ICT such as drone, BIM/CIM, tablet and smartphone application etc. 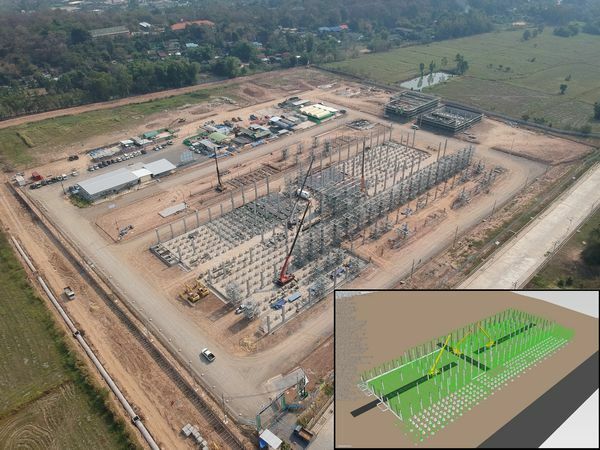 to promote work efficiency in Thailand construction site (Photo 2). In 2015, the Thai government indicated "Thailand 4.0" as a vision of economic society to be a long-term goal. I believe that innovation from Japanese companies and implementing Japanese technologies are indispensable for fulfilling this vision. 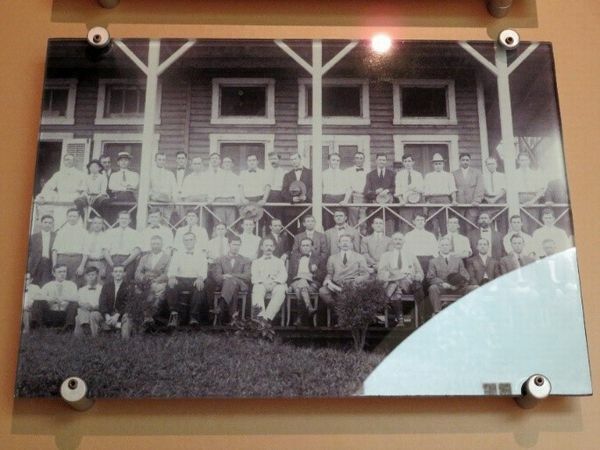 I grew up as a global engineer through experience in the International Division, Shimizu Corporation. As the next challenge, I would like to apply the concept of “Glocalization” to my current work. Since Japan's technology matches Japanese standards and features, using in Thailand as it is may cause excessive functions and specifications. For this reason, we need to consider "Glocalization" by implementing and developing Japanese technologies those can fit to local needs. 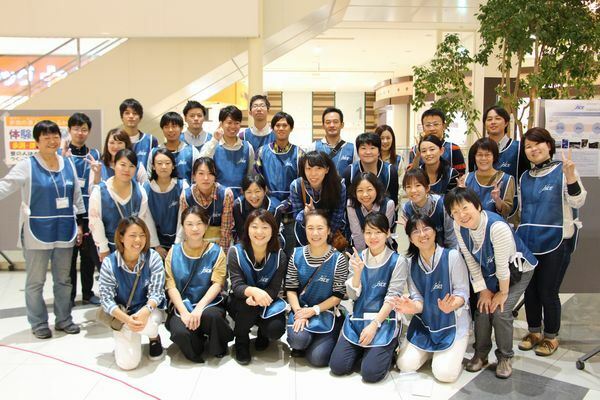 It is also important to consider how to make Japanese quality with competitive price. Through this challenge, I am striving to work daily to become a bridge between Japan and my home country. Profile: I was born in 1978 in Bangkok Thailand. In 2003, I graduated PhD from The University of Tokyo and after graduation I joined Shimizu Corporation, Japan. I have worked in Tokyo head office and International Division in Singapore around 14 years. In June 2017, I was assigned to work in my home country Thailand and now I am working at Bangkok Office. I think that many colleagues and friends of Dr. Peerapong Suthiwarapirak welcome this article in Alumni of DOBOKU. He has a very broad circle of acquaintances in Japan: all ages, men and women, and inside and outside his professional field. He is fluent in Japanese and understands Japanese culture deeply, after learning hard as a non-Kanji country origin. He is still putting his career forward by learning new fields at universities and by increasing knowledges and friends there. Occasionally, he shows a valuable perspective to us about Japanese way of thinking and society with good humor. I think that we should listen to his opinion on the globalization of Japan, because he is our alumni who understands and loves Japan. Since its establishment in 2001, the Civil Engineering Design Prize has been awarded to 164 projects. 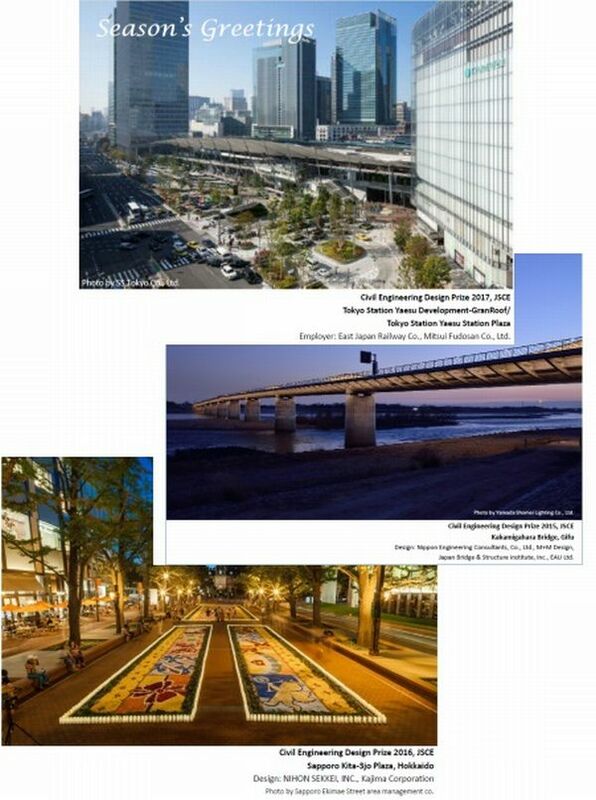 Prize-winning projects include not only structures such as bridges, roads, waterfronts, dams, stations, parks, and squares, but also public spaces and community renovations of different scales and at various locations. However, what those projects have in common is the collaborative relationship among the engineers, designers, planners, and community residents, which was developed with the aim of creating and conserving landscape that integrates the surrounding environment and community. 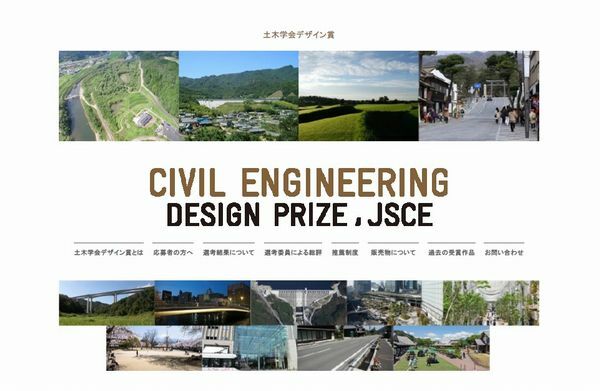 The Japan Society of Civil Engineers uses photographs of the prize-winning projects for the greeting cards sent to our overseas agreement of corporation societies at the end of the year. The prize is managed by the Landscape & Design Committee. The judges, who are specialists in their respective fields, actually conduct a field survey to screen the applicant projects. One of the characteristics of the prize is that projects must be at least a year old. In other words, we believe that infrastructure and public space design projects should be evaluated not by their beautiful appearance just after completion, but by how they are after passing through at least one cycle of four seasons, being exposed to wind and rain, and being used by people. Another characteristic is that the prize recognizes those who were involved in the project. Civil Engineering Consultants Committee conducts research and study on professional consulting services. Our tasks are considered to deliver “knowledge and intelligence” consolidated in JSCE to the society in an easy-to-understand way and to resolve the various questions and issue. Therefore, we prepare many opportunities to identify the various needs of the society using two-way communication with the society. Here, some recent activities of the committee are introduced. 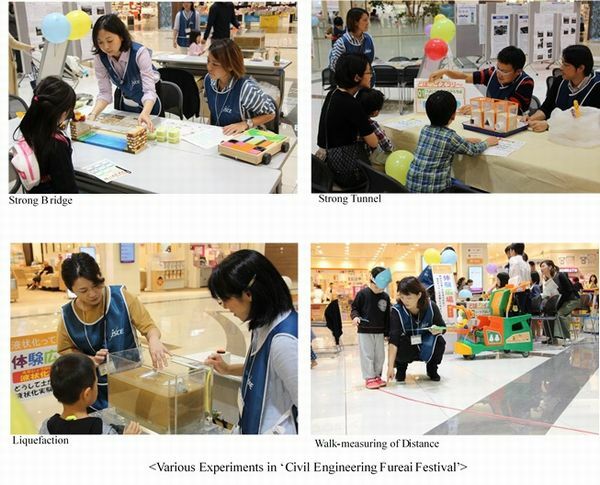 ‘Civil Engineering Fureai Festival’ is held in various locations once a year. The theme of this event is “civil engineering as foundation of daily life and safety.’ Our aim is to make an opportunity to enrich public understanding in civil engineering. Last year was our 10th anniversary, and it was held in Fukuoka. In this event, we prepare several experiments that participants themselves can join and learn about infrastructure. By going through experiments, participants can learn how civil engineering supports our daily life. Our staff helps to carry out the experiments, but the point is to make an opportunity for public to feel and think about civil engineering. In order to create a good opportunity for all ages, we also prepare some squares: ‘Panel Square’ that introduces local civil engineering heritages and disaster prevention maps and ‘Playing Square’ where kids can enjoy coloring books and reading picture books about civil engineering. We receive valuable feedback from participants that they become more interested in civil engineering by attending this event. he committee has held a series of symposiums, inviting leaders who promotes their regional revitalization as speakers. The theme of the third symposium was a road station and regional revitalization. The symposium focused on an approach and its viewpoints that situates a road station as a basis for regional cooperation and regeneration. The addressed road stations were ‘Tomiura’ and ‘Hota Primary School’, showing remarkably vital activities as successful road stations in a suburban area near Tokyo. 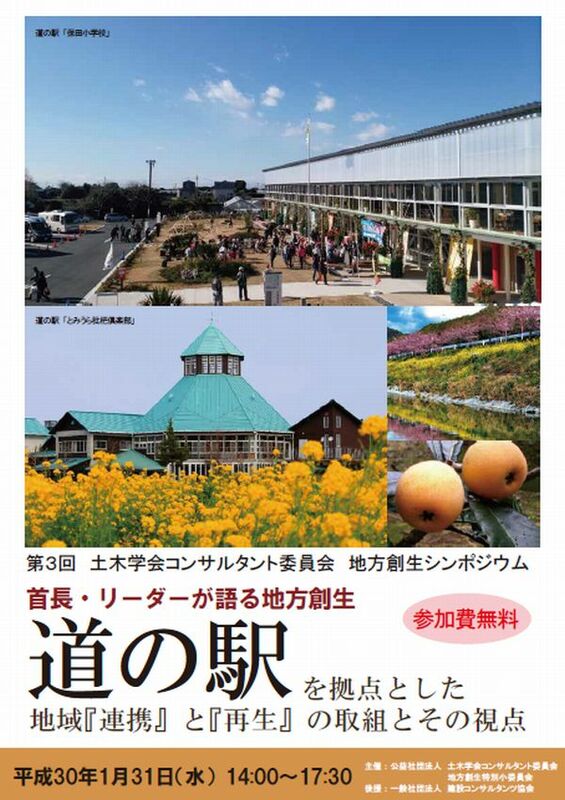 ‘Tomiura’ has been a regional center of revitalization for a long time by cooperating closely with surrounding communities and agriculture. ‘Hota Primary School’ is widely known as a road station reusing the abolished school. In this symposium, we learned the regional revitalization from the viewpoints of infrastructure maintenance and conservation by having a true figure of these successful cases, and then discussed the role of infrastructure engineers in regional revitalization and the expectation for the engineers from the society. 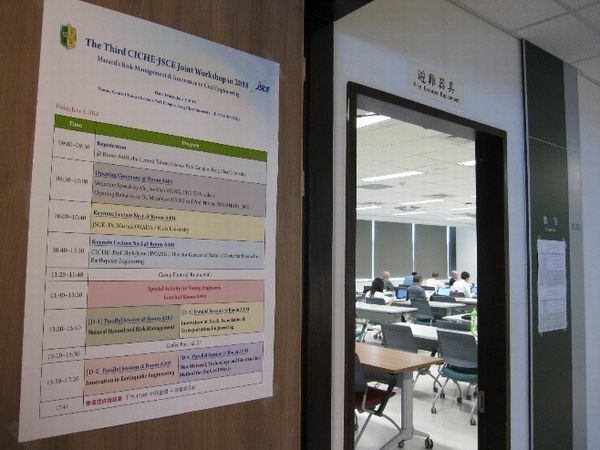 The 3rd joint workshop between JSCE and Chinese Institute of Civil and Hydraulic Engineering (CICHE) was held on June 1 and 2, 2018. The workshop was organized alternately, year by year. The previous workshops were held at Kaosiung Taiwan in 2016, at Tokyo in 2017. In 2018, the third was held at Feng-chia University, science and industry park area in Taichung city. The workshop began with the welcome speech by CICHE President Jaw-Lieh Wang. Opening remarks were given by Professor Masahiro Ouchi, Kochi University of Technology. After the warmhearted remarks, including the brief history of the workshop by Professor Chi-Wan Hsieh, plenary lectures were given by Professor Masaaki Okada, Kindai University and Professor Shyh-Jainn Hwang, National Center for Research on Earthquake Engineering. The former lecture introduced the attractive techno-scape of lime mining cities in Japan and Taiwan. The latter lecture described the challenges of seismic disaster mitigation of the research center from both hardware and software aspects. 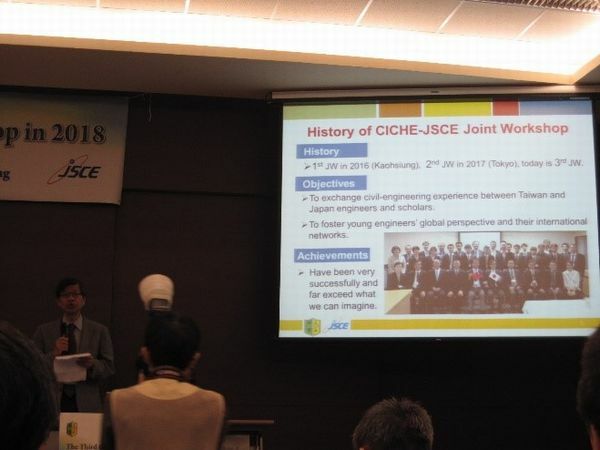 The JSCE-CICHE joint workshop, particularly, encourages the young civil engineers in the international teamwork. The session aims at enhancing international cooperative ability through a game. This time, the topic was robot assembling. The participants were divided into several groups. 7 Japanese graduate and undergraduate students from Kyushu University, Kochi University of Technology, and Hosei University joined the game. Each of the teams was required to assemble a robot with small pieces of Lego blocks by line operation such as selecting pieces, assembling small parts, assembling larger parts, and checking the qualities. In the afternoon, there held parallel sessions titled “natural hazard and risk management”, “innovation in earthquake engineering”, “innovation in track, foundation and transportation engineering”, and, “new material, technology and construction method for the civil works”. Two speakers from earthquake committee of JSCE joined the session, with the consideration of Hualien earthquake in February. On the second day, technical tours were provided. The city of Taichung has become the second largest in Taiwan, recently. In order to avoid the traffic congestion, MRT system is constructed. 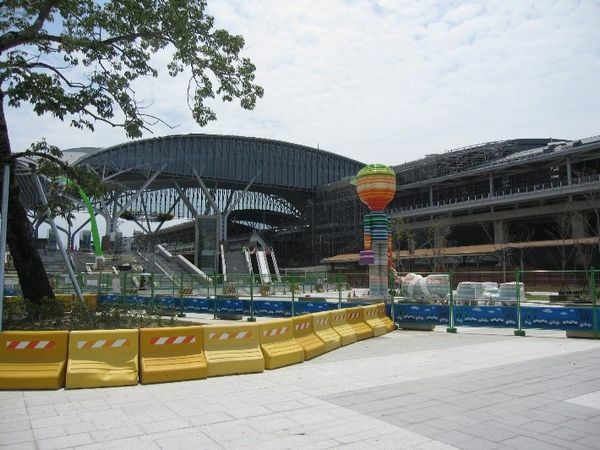 Construction site of one of the MRT stations was chosen. 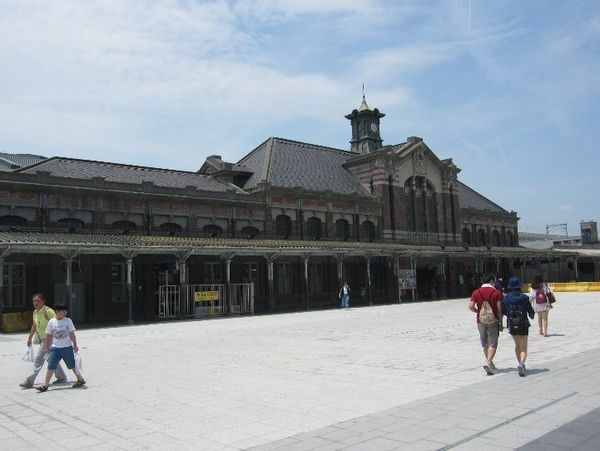 The other site was Taichung station that was built in 1917 and recognized as one of the historic stations in Taiwan. While a new station is constructed, old station will be also reserved as a museum. CECAR8 (8th Civil Engineering Conference in the Asian Region) was also announced by JSCE that hosts the conference and many participants were invited from Taiwan. Needless to say, the next joint workshop will be held in Japan to keep the communication with Taiwan. Finally, the workshop was supported by the international exchange fund of JSCE international committee. The authors, Taiwan exchange group, would sincerely appreciate the support.